‍What's the most effective way to spread a vegan message? A massive 92 percent of respondents said supporting a reducetarian approach is helpful to the vegan movement, in a casual poll carried out by UK retailer The Vegan Kind. The outlet - an online vegan supermarket as well as subscription box service - asked its followers on Instagram: "Do you think it's harmful or helpful to the vegan movement to support and encourage any and all reduction in consumption in animal products rather than always promoting a 100 percent vegan switch overnight?" Just eight percent said it was not helpful, with the overwhelming majority saying the reducetarian approach - generally understood to mean supporting small steps towards a vegan lifestyle - is effective. 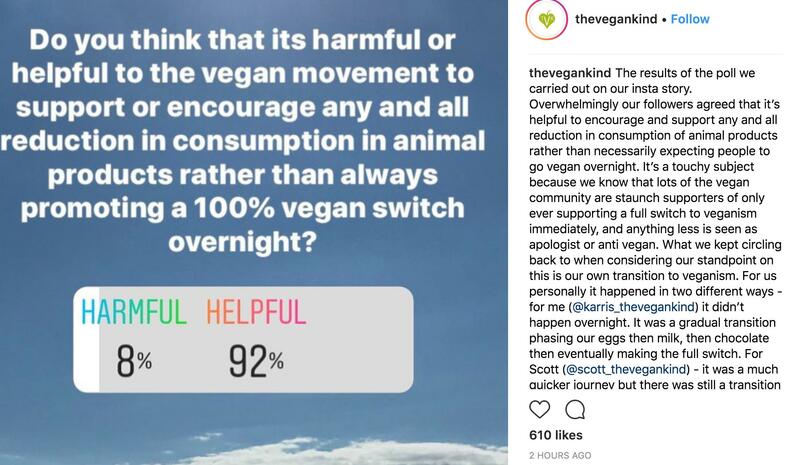 Commenting on the poll results, The Vegan Kind Co-founders Karris McCulloch (who set up the business with husband Scott) said: "Overwhelmingly our followers agreed that it’s helpful to encourage and support any and all reduction in consumption of animal products rather than necessarily expecting people to go vegan overnight. "It's a touchy subject because we know that lots of the vegan community are staunch supporters of only ever supporting a full switch to veganism immediately, and anything less is seen as apologist or anti-vegan. What we kept circling back to when considering our standpoint on this is our own transition to veganism. "For us personally it happened in two different ways - for [Karris] it didn't happen overnight. It was a gradual transition phasing our eggs then milk, then chocolate then eventually making the full switch. For Scott it was a much quicker journey but there was still a transition phase. And now look at us...We have a business that employs 11 lovely compassionate people who feel the same way we do...and have dedicated our lives to helping make veganism easier for everyone." 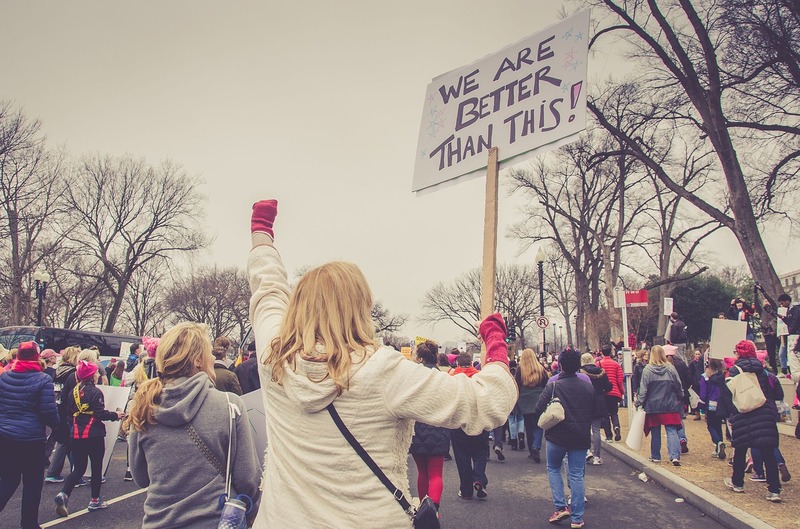 Karris added that an instant overnight switch to veganism 'is NOT going to work for everyone' - and she feels that people should be encouraged to make small steps. She was clear in her pro-vegan position, saying: "We will always educate, raise awareness and compassionately promote veganism as the moral baseline and the only final destination in our eyes. "But we will not discourage others from making any steps that help get them started on that journey with the hope and faith that they will also arrive at the same place we did - the realisation that animals are not ours to eat, wear or use for any reason." The post received a slew of positive comments, with almost every comment (at the time of writing) agreeing with this position. Top blogger and owner of Peckham-based vegan eatery Deserted Cactus, London Afro Vegan - aka Esme Carr - said: "More people need to stop being up their own judgemental backsides with the all or nothing crusades. "It's unfortunate, but a lot of folk once they go vegan forget where they came from, and get on a high horse so high that they lose all sense of compassion for anything other than their own set views and opinions of how people are meant to vegan. "However, it's not all bad. There are so many brilliant and lovely folk out there you can just drown out the rest." As the poll pointed out, not all people believe supporting a reducetarian approach is effective, with some believing it supports the continued exploitation of animals. Adding to this conversation, one commentator wrote: "My only fear is that when we support these baby steps, we give the message that it is ok to still eat cheese, or drink a bit of milk. This is saying 'a bit of animal exploitation is ok'. If we say small changes are enough, people may feel that they are doing enough, when they are not vegan. I believe that you cannot use animals when you truly open your heart to the vegan message. So I think promoting the idea that reducing is enough can tarnish the meaning of veganism." Another added: "I can see both sides. On one side, it’s difficult once you’re an 'established' vegan who’s been doing it a while and knows how and what to eat, to watch a person who you know knows all the arguments for veganism and agrees with them still eat animal products."